We have another recycled magazine craft. This one is a garland. I was trying to fold the magazine pages to look like fabric yo-yos. We folded each page in half lengthwise and then folded it accordion-style as if we were folding a fan. Then, we stapled two of the little fans together to create the circles. Kids can help fold the papers, but an adult should do the stapling as it can be tricky to get the staples in the right place. To make the connectors, we just folded pages in half lengthwise, again and again until it made a "cord". We threaded each cord through one side of each circle to connect the circles. We put a foam Christmas sticker in the center of each circle. The stickers serve as decoration, but also help hold the circles together better. 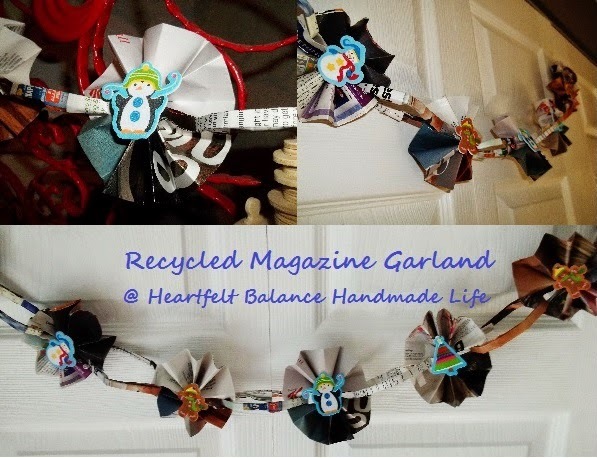 Have you seen our other recycled magazine crafts? The picture will take you to the link. Do you have an over-abundance of magazines lying around? 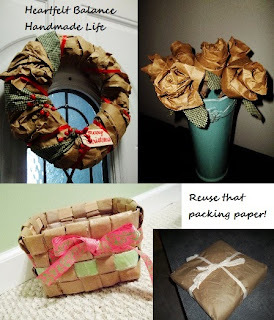 You might also like how we recycled all of that packing paper from our online shopping! Hi Kezzie! Thanks. I have not tried the paper beads yet, although I have been wanting to!! I was also going to make one of the paper bowls from the magazine strips. Thanks for stopping by. I'll try to be by tonight!